I have put this web site up on the internet to tell the story of a very special place on this earth. It is about a ranch in North West Colorado called Crosby Creek Ranch. Crosby Creek Ranch is a 1440 deeded acre ranch (surface area; 1500A) located in Jackson County Colorado. It is at the base of Buffalo Pass, the pass between Steamboat Springs and Walden. Crosby Creek Ranch (CCR) is the relatively new name for the ranch (1996). It started out, in its current configuration as the Johnson family ranch in the 1920's. The first settlers came to the valley in the late 1800's and the first homesteads were issued in the early 1900's. Several Homestead Act deeds were issued in the first two decades of the 20th century in and around the current ranch. The Homestead Act of 1862 was an act of congress (during the Lincoln presidency) where the US Government offered to anyone who would develop a homestead, free title to 160 acres. All one had to do was file an application, improve the land, and file for a deed. Otto Johnson and his family were one of those families. Otto died in the mid 1930's and one of his sons, Del continued on developing their 160 acres and added to it. Through the years, Del and Lena, his wife, bought out several families until he pretty much owned the whole valley. The present ranch owned by our family is where the the main ranching operations were located. 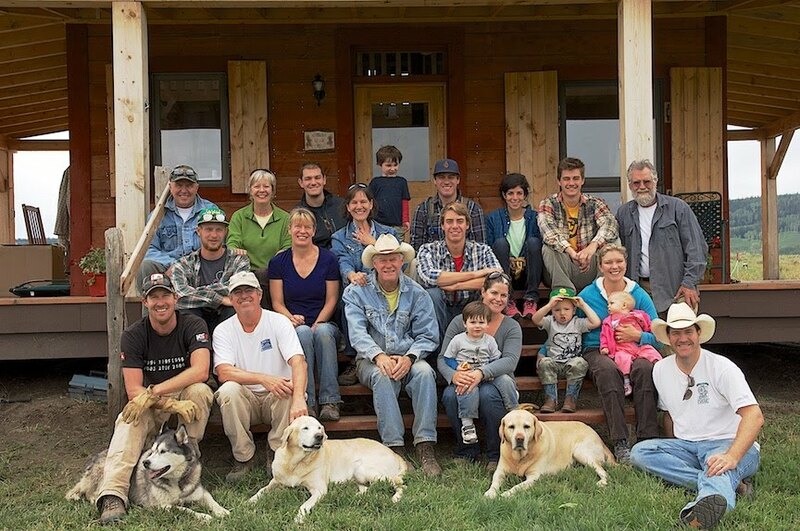 There are presently 3 families that own the ranch. The Hoffner Family, the Menk family, and the Scott family. We bought the ranch in 1996 from Everett Randleman who had resurrected the ranch from certain death (by this, I mean development) when he came in and bought several parcels that had evolved from the original ranch after it's sale in the early 1970's. We bought the ranch with ranching in our DNA but, with basically, little practical experience. We learned by doing, and now, after 21 years of hard work, we feel we have a pretty good handle on things. In 2007 we started to put the ranch under a conservation easement with the Colorado Cattleman's Agricultural Land Trust . The reason we did this was two-fold. First, and foremost, we wanted to preserve the ranch for future generations. Secondly, the incentives offered by, both the Federal Government and the State Government allowed us to re-coop most of our original investment in the ranch. In 2010 we suspended the process because the values for land had declined to the point that it was not economical for us to continue. We have one more section of the ranch to place under easement to complete the process. This will occur when values return to their historical levels. 1) A history of the ownership. Including pictures of the original deeds of ownership, water rights and other interesting documents. 2) The Conservation Easement Including the process for those who are on the fence as far as whether they want to do a conservation easement. Documentation and a small tutorial on how to go about placing an easement on your own ranch. 3) Pictures of the ranch. Both landscape pictures and some of the activities that have taken place will be included. 4) Maybe I will include a blog for gathering input from both owners and interested parties.